First I would like to say you thank to choose me as an expert here. I am new at Live Person but I have my own practice and doing reading for many years. 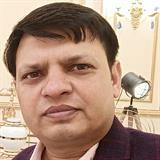 I shall help you in your love life, if you feel sorrow with your love mate, doubts on his/her, someone else in life, reconcile marriage issues, and kids problems I shall also help in your career, new job, promotion in position, switch over, money, financial growth, dues and all your daily issues like property purchase. If you feel any other sorrow, stress and bad situation in your life path you please come and discuss with me I will feel pleased to be your expert here.